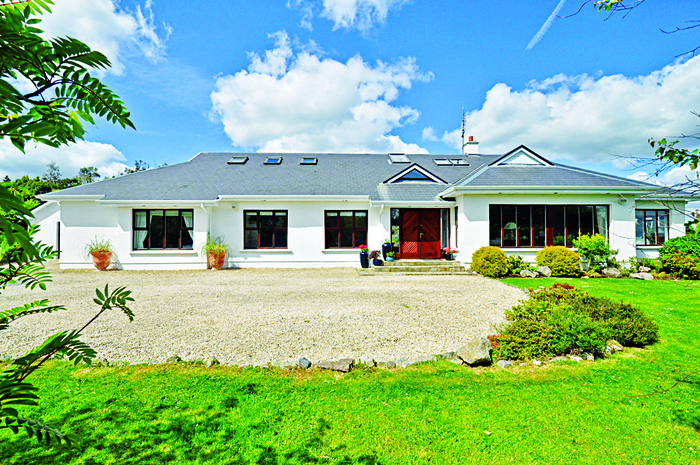 O’Donnellan & Joyce is offering for sale a beautiful family home at Corcullen, Bushypark, Galway. This large, immaculately finished, residence is one of the finest family homes to come to the market in some time. Incorporating large, bright rooms, extensive patios, magnificent gardens, and spectacular views of Lough Corrib, it provides gracious accommodation in excess of c4,000sq ft on a 0.82 acre site. The house includes four reception rooms, five bedrooms (two en suite ), a double height entrance hall, and large playroom, office and studio/gymnasium. Outside are a large garage, glasshouse, extensive lawn, and mature shrubberies throughout. Standing on an elevated site, it enjoys breathtaking views of Lough Corrib and the surrounding countryside. Perched above a peaceful road just off the main Moycullen route and three miles from Galway city, this stunning home has been meticulously thought out with flair and taste in both architectural layout and interior design. Its idyllic setting offers a range of facilities required for modern living within easy reach. This massive property is teeming with extras such as superior quality fixtures and fittings throughout, an ultra modern kitchen with large island, and easy access to the garden through four double French doors. Nothing has been spared on the finish of this house which puts it into a class above the rest. Viewing is highly recommended and guaranteed not to disappoint. The BER is C2. Asking price is €675,000. Contact Colm O’Donnellan of O’Donnellan & Joyce auctioneers on 091 564212.